Sikhs believe that the Guru Granth, the holy scripture, is their living Guru. A hukam is a verse selected at random from the Guru Granth, and is considered a divine command. A hukam is read so that Sikhs may understand their Guru's will. 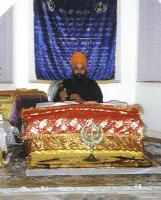 An established protocol is to be followed as outlined in the Sikhism code of conduct whenever reading from Guru Granth. First mathatake, bow respectfully before the Guru Granth. Consider any Sikhs present to be embodiment of the Guru's spirit. Prakash ceremony is to be performed before opening the Guru Granth Sahib to invoke the Divine Enlightener. No one is allowed to look at opened pages of the Guru Granth, unless ardas, a prayer of petition, has been said, and a hukam, or random verse, has been selected and read. A hukam is selected, and read aloud, at the conclusion of any worship service or ceremony. A hukam is considered by Sikhs to be their Guru's order. Kirtan, the singing of hymns. Kathaa, a sermon on the subject of Sikh scriptures or history. Only a Sikh man or woman may attend the Guru Granth. Only a Sikh man or woman may read aloud from the Guru Granth when others are present. Anyone, whether or not a Sikh, may read from the Guru Granth when others are not present. A Sikh man or woman, who is able to read the Gurmukhi script, acts as an attendant, or granthi of the Guru Granth. The granthi or another Sikh offers a prayer. The granthi turns back the coverlet and turns to a random page anywhere in the middle section of the Guru Granth. The granthi selects the verse which is to be read, from the top left page. The page may be turned back if the verse selected begins on the previous right hand page. The verses of Sikh scripture have different headings depending on type and author. If the verse is part of a series, it will contain a one or more sloks, and a pauree. The granthi reads the verse selected the aloud so that every one present may hear the hukam, and receive the Guru's order. The granthi begins by reading the first slok. The granthi continues reading including any sloks which follow. The granthi includes the entire pauree reading through to the final verse, and finishes with the last line at the end of the verse where the name of Nanak appears. Hymns Offering Encouragement in Hard Times: "Dookh Santaap Na Lagee"